Born and raised in Japan, Yayoi has lived in Vancouver since 2002. She is a graduate of Toho Gakuen College of drama (1972), and in 1975 co-founded Mime Theatre Pierrot-kan to popularize pantomime in Japan through modern works. Over the past 30 years she has continued her study of Japanese dance and movement such as Kagura, Noh, Kyogen, Kabuki-dance as well as western dance both classic ballet and modern dance. Her mime study has been in both Decroux and Lecoq system. Very early in her career she has had a passion for teaching mime, dance and movement. In 1989, she became the first mime artist to receive the Japanese Ministry of Education Fellowship, and spent a year collaborating with mime and dance artists in Germany and Canada. In 1990, she founded YAYOI THEATRE MOVEMENT Society. Her international performances include festival appearances in Germany, Slovakia and 7 other European countries numerous Asian tours as well as five North American tours. Her collaboration work with international artists include work with Canadian photographer Courtny Milne(1995), Japanese Jazz musician Terumasa Hino(1996), Halina Witek (Holland 1997 ,1998). For her collaboration with Bulgarian actor Nikolai Sotirov in both Japan and Bulgaria, she was given the Bulgarian Experimental and Avant-garde Performance Art Award in 2001. Yayoi´s career as a mask carver began 1996 under the mentorship of Noh-mask Master Fujio Fujimori. Since then she has created 15 unique Noh-style masks which have all been used in various performances. In 2005 Yayoi created a new solo work Four Seasons which debuted in October at the Scotia Bank Dance Centre. In 2007 she collaborated with musician/composer Wendy Bross Stuart to create Mothers a dance/musical celebration of motherhood. 2008, she performed in Pangaea.Arts Life of Paper , and presented an original Stories in collaboration with pianist Sara Davis Buechner at the Powell Street Festival. In the fall of 2008, she co-created and produced Shinju  with fellow Japanese Canadian actor Manami Hara. Interpreting a traditional Kabuki theatre story Shinju used mime and dance, both traditional Japanese and modern western with Canadian actors on stage. In May 2011, she produced and performed a dance work Identity-Ancestral Memory  in collaboration with Jay Hirabayashi (Kokoro Dance) at the Revue Stage on Granville Island in Vancouver. A life long dream to present a Greek tragedy in Noh-theatre style let to Yayoi´s collaboration with director Peter Hall of Mortal Coli to produce Medea/Rokujo in Nov.2013 at the Orpheum Theatre Annex. 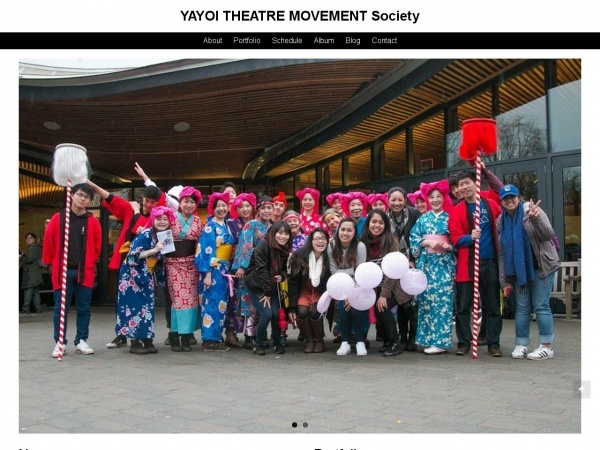 In September 2014, Yayoi received a Canada Council Grant for Dance Professionals to research Japanese dance forms and history pre Noh theatre and Kabuki from 800 to 1800. She spent October & November in Japan doing her research.